There is no denying that Rudolf Nureyev is one of the greatest ballet dancers that ever lived. What we may not know is about his private life and more importantly, the events that led to his defection from the Soviet Union in 1961. Ralph Fiennes’ third film as a director tries to cover that past story in a movie that has plenty to admire but is far from perfect. Rudolf Nureyev heads to Paris with Russia’s Kirov Ballet, where he is forced to play by the rules. This is a man who doesn’t believe in compromising with authority and heads off on a tour of Paris alone, yet the restrictions that his Soviet bosses mean that he cannot have a growing relationship with Parisian Clara Saint and is stifling his one love: to dance. The White Crow is Fiennes’ most ambitious work yet, after the Shakespearian updated Coriolanus and the love story The Invisible Woman. 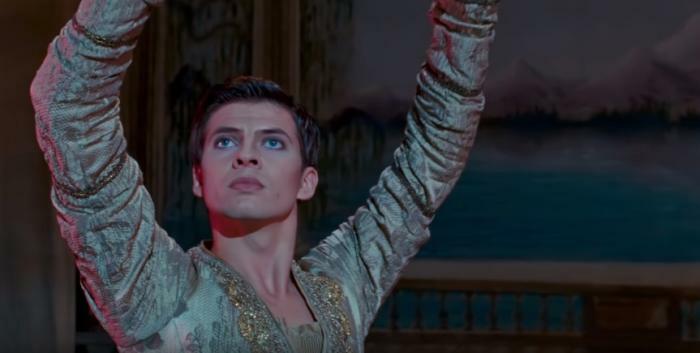 The film plays around with timelines, showing Nureyev’s life in three very different stages. The main bulk of the action takes place in Paris, where the young man, full of arrogance and attitude, refuses to listen to his superiors and mainly the Soviet agent, who has come along to make sure the dancers follow Soviet rules. Interspersed are scenes of Nureyev in Russia where he is taken under the wing by Alexander Pushkin, a quietly spoken ballet master of the Vaganova Academy of Russian Ballet. Nureyev is desperate to please his teacher while finding himself the object of affection by Pushkin’s wife, Xenia. Mixed in with these two threads is a third, which examines, very briefly, Nureyev’s childhood. Filmed in virtual monochrome, we see his birth on a crowded train to being abandoned by his father in the woods. Unfortunately, this is where the film somewhat falters. Jumping from one timeline to another, you never really get to grips with Nureyev as a fully rounded character. He was full of bravado and often came across as egotistical, which makes it hard for you to sympathize with him when he is forced into defecting. During the first two acts of the film, it drags its heels, often giving us too many moments when Nureyev is seen looking at sculptures and museum pieces, which brings any of the action to a grinding halt. What does work is the cinematography. Filmed in a 60s style with grainy film stock and uncontrolled angles, it does evoke the period well. The final 20 minutes are also a triumph, as Nureyev is faced with making a life-changing decision. The tension is brimming, and even though we know the outcome, Fiennes gives us enough suspense to cause our hearts to beat a little faster. The sound also helps, as we hear every step, every jump from the dancers as they rehearse. The fact that Fiennes has decided to have everyone speaking the language they are from, instead of having actors putting on accents while speaking English makes for a more realistic presentation. Mainly in subtitles, it gives the film real authenticity. Oleg Ivenko as Nureyev never really captures his flamboyance. Not his fault as the script doesn’t allow him to grow, often coming across as an overly confident big head which, when he doesn’t get his way, throws his toys out the pram. A pity because Ivenko is a pretty decent dancer and without any trickery, he is the man making all the moves. Fiennes, playing Pushkin, is easily the best thing in the movie, underplaying his character while speaking fluent Russian. Sadly the spark between Ivenko and Adèle Exarchopoulos as Clara is never there and so the romance, which should have been the sole of the film, is lacking. The White Crow never really captures the man and his world, instead delivers a sketch of what he was like. With better pacing and less jumping from one time to another, the film could have been more engaging. For such a legend, this is less than legendary.